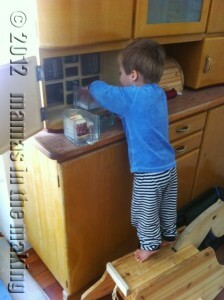 This post is part of the Just playing series inspired by Childcentralstation. Instead of us telling you about play – YOU are invited to watch play at its best. Observe the pictures and tell us: What do you see? What is happening in the photos? What are the developmental values embedded – possibly – in the scenarios? Why is any of this play important? 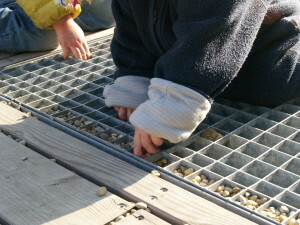 Three kids age 1, 2 and 3 discovered this gutter and small stones today. The obvious thing to do was… well throw the stones down the gutter. 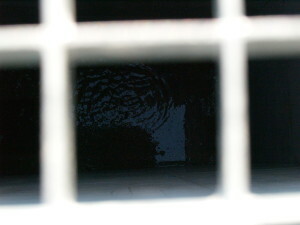 At the bottom was some rainwater left from the previous rainy days. They simply couldn’t stop. All three of them just played and made their own experiences. The stones. The holes. The water. Sounds. I almost forgot to mention a 35year old enjoying this play by simply watching the kids. Feel their experiences. Hear the sounds, the laughter, the joy. Were they really just playing? 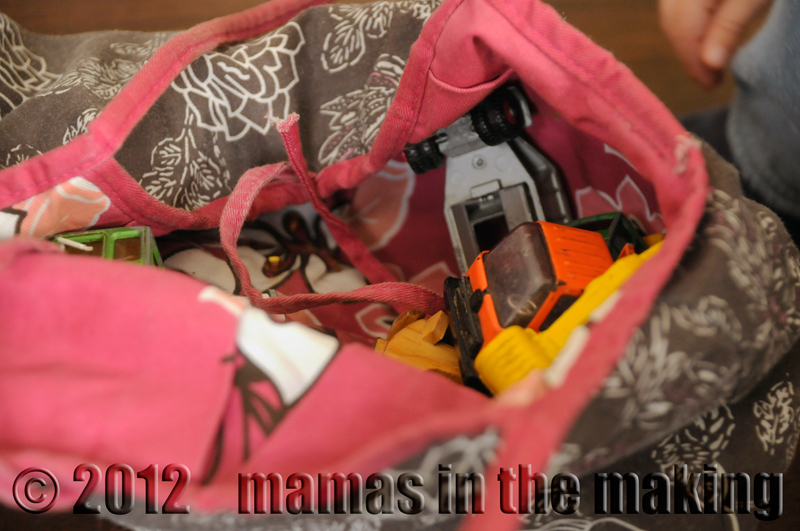 This is a Blog Hop! What’s that? Get your code here! We probably all know the situation. There is something on the coffee table. A mobile phone, a good book or a nice candle holder. A one- year-old comes approaching with big wide eyes and arms stretched out to grab whatever is there to grab. With a big grin he holds our mobile phone, book or the candle holder in his tiny and sticky hand. We already see it drop or go into his mouth. We don’t want either, so we take it off him and put it back on the table. Right back within his reach. This time we see the child approach again and we try and stop him right away. “No!“ maybe followed by a “You can‘t have that.“ or “This is not for your tiny fingers.“ But the child won‘t listen. The object is too interesting. The child is too curious. So the game can continue forever. Or we simply put the objects out of reach. This is the first lesson in simplicity our children teach us: Don‘t have stuff lying around that you do not want to have in kid‘s reach. While the children grow and we will at some point run out of places high or hidden enough for the child to get to we will learn a much more rewarding lesson: Don‘t have stuff lying around at all. Ever. Have a place for everything. Too often when we clean up we end up with a pile of little things we don‘t know where to put. Even if it is just a drawer you create especially for “random stuff“ – this helps you to have surfaces clean and tidy. And you don‘t end up looking for those things all the time because you know they must be (somewhere) in this random stuff drawer. So instead if you grab an object go all the way to where it belongs and place it there. You might end up walking around a bit more? Maybe you end up picking up more things on your way and so end up having less stuff lying around and fewer times to walk around the flat. If you want your children to clean up after themselves and place things where they belong – do so yourself. Do it slowly and carefully. Don‘t just quickly throw the cloth from the table into the sink. Don‘t kick your shoes off and push them near the shelf. Make an effort to carefully carry the things to where they belong. Your children are watching you. But they need to see every movement. They can‘t follow if you are too quick. They will try and be quick too and might leave things in the way or even break them. And no matter how many times you repeat and repeat and repeat… they will end up doing what you do, not what you tell them to do. Once you get into the habit of putting things back where they belong, of tidying up and clearing the surfaces you might soon realize that you don‘t look at or use the things you have now put into the cupboard or drawer that often anymore. You might forget about them altogether. If so – you could just get rid of them. At some point this tidiness might even lead you to not buying things anymore. 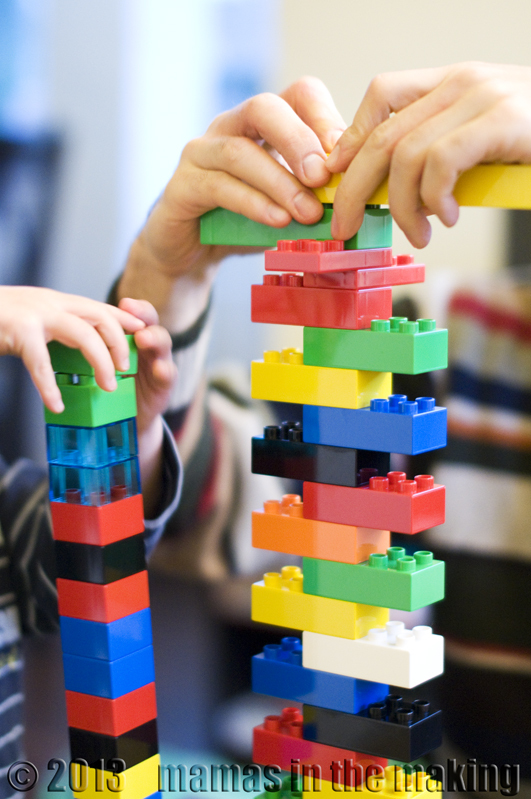 We dare to say that most children in the western world have far too many toys in their room. Small babies are surrounded by stuffed animals, balls and blinking mobiles. The older they get the more toys move into their play space. Often it‘s well intended to encourage and nurture the child‘s both happiness and development. But the truth is – they don‘t need that much. Often they don‘t need anything at all. This is why we have started The toy revolution. Of course kids like shiny and blinking toys. But we like chocolate or this 5th cup of coffee too. Do we need it ? Children are explorers. They are creative by nature. 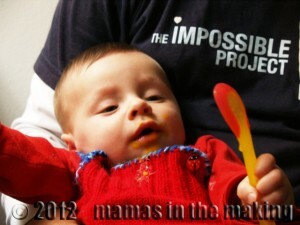 They make the most wonderful toys out of a spoon and a cup, a twig or a ball and a blanket. If you are gifted with too many toys and can‘t bring yourself to give them away – keep them in a box. Limit the amount of toys in the play area to keep it simple and clear. It‘s nice to have „something in the back“ that your children might „forget about“ for a while. Don‘t be scared of kid‘s boredom. It doesn‘t exist. And even if they do get a little bored every now and then – THAT is encouraging. Challenging. Being busy is a motto of today. We are all busy and we are always on the go. There is stuff to do, people to see, schedules to fill… and then you have kids. The choice is yours – will you keep up with the world, filling your diary with stuff to do, or will you simply let a day go by sometimes? Separate the things you need to do, the things you want to do and the things that you do because… if you have no good reason, maybe skip it? Give yourself and your kids a break. Sure, it’s nice to have all those coffees with friends, but why should your toddler behave through all those adult conversations? Schedule less. Try to just be with your kids. There will be time for coffees and lunches with friends. There will never be another childhood for your kids. And then there is the baby gym, swimming classes, piano lessons, and other stuff that is never too early to start with… or is it? Your child probably has enough exercise as is (see one of our many posts on movement if you have doubts ), and playground seems like a social enough place. 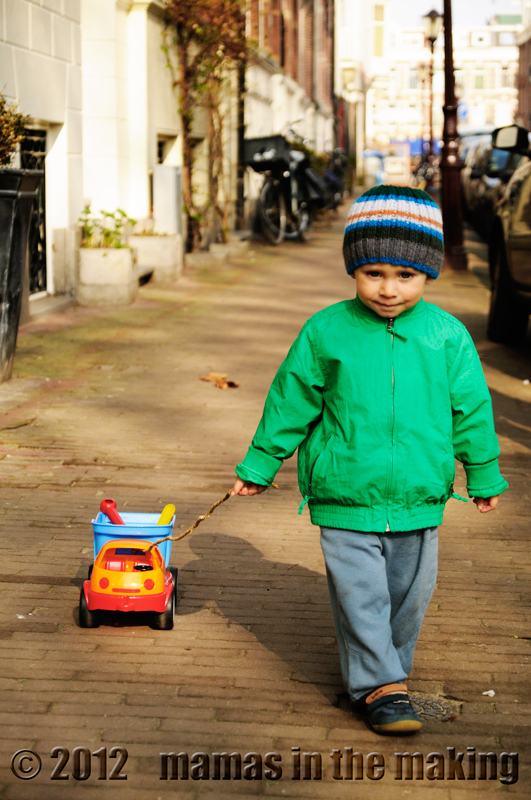 Resist the urge to fill your toddlers days with scheduled program. Let him play freely and just watch what happens. There will be time for filling his diary with ‘stuff-to-do’. Let your kids be. Let yourself be. And enjoy every moment of it – it will be gone to soon, when the time comes for filling in the schedules. We could go on and on. But we want to keep this post simple. There may be follow ups. There will surely be more lessons to be learned. More stuff to be thrown out. We’ll keep you posted. What do you do to keep your life as a family simple and sane and your house clean? Tell us, we are always keen on another lesson in simplicity! Our boys are now over two. A lot has changed since they were born, and their life (and our too) has been influenced by many wonderful people, ideas and thoughtful conversations. One thing that never changes – we still love watching them play, and we still admire how much is hidden under this one tiny umbrella term – PLAY. Learning, discovery, experimenting, mastering, hypothesizing, trying out, compromising… you name it, it is all there – in their play. Here and here we talked about what play looks like for children until 1. 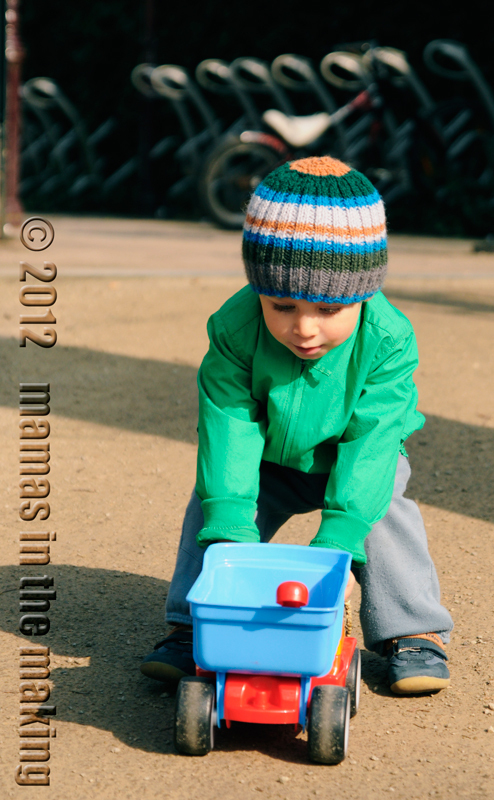 So, what do toddlers do when they play? Well basically – Play can be divided in two. 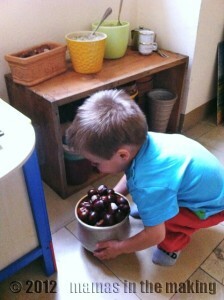 On one hand children play to follow their needs. They are driven by some inner urge that is almost impossible to resist. On the other hand – there are the toys that mainly we provide. And the child, following Heinrich Jacoby, asks: ,Thing – what do you want from me?‘ and explores what he can do with it. Children at every stage of their development have certain needs that emerge within their bodies, in connection with their brain, and which they have to follow. It might be that „your toddler’s desire to climb makes you want to climb walls“, but it is not something they are doing on purpose, and asking them to stop is futile – the urge is stronger, and more importantly – it’s necessary. Surely you have seen a ton of moments like this. The developmental urges are similar, only stronger – the body wants what it wants, and not only that. These are all the things that the little body needs to do, for the big body to later fare well in life. Knowing what these things are can help us in finding safe ways for our children to explore the world, do what they need to do, all the while making sure they are safe and happy. Recognizing those urges in our children’s play not only allows us to offer safe ways to fulfill their body’s needs (‘I know you want to climb, but I cannot let you climb on the table. Why don’t we go outside and find something you can climb on.’), but it also gives us as parents a unique view on their developing bodies and minds. 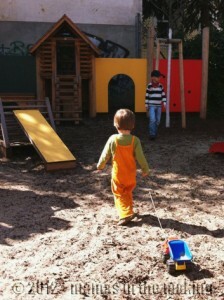 It is easy to say that we should observe children at play, but hard to do when we don’t know what we’re looking at (http://everymomentisright.blogspot.nl/2011/09/day-in-life-of-scientist.html) – it takes time, trust and practice. 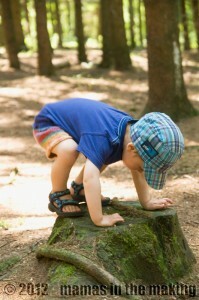 Knowing a little bit more about the natural ways in which children develop gives us more joy in observing them as well. 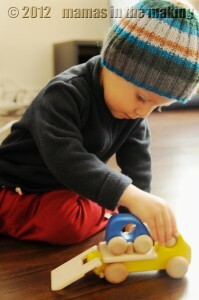 We also believe that the best toys (or, as Magda Gerber called them – play objects) to best support toddlers in these activities are exactly the simple, open-ended toys you don’t need to spend a fortune on, some of them you might already have, and a lot of them you could even find interesting to play with (more on that in the next post)! So, first things first, what are these urges? Carrying things around, from place to place. Moving objects from place to place. Carrying things in your hands one at a time, or all at once. Perhaps filling a toy truck and going around with the load. Putting things into other things and then taking them out, filling containers, putting their thumb into their mouth and taking it out. Pouring water into a cup, and then into another cup, and another… stuffing all the toys in one box, bag or basket. Making circular movements with things, walking around something, spinning toys, turning around, watching the washing machine. Joining toys in a long line, joining train tracks. Making a long line of toys and then rearranging them. Putting blocks on top of one another, or in a line. Finding a place for something or oneself, putting things on their heads, placing things one on top of the other. Rearranging toys, books, things on the table. 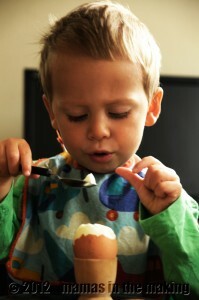 Perhaps putting forks next to placemats before dinner time? This is probably the most challenging activity for us as adults. Because children don‘t just climb onto a chair or a sofa. They move things around to climb even higher. Because we hide things from them by putting them into heights they can‘t reach. And therefore make these more attractive. (Not to mention the fear of them falling – but that is another topic we will discuss at some point later). But remember that climbing is a strong urge (see Lisa Sunbury’s post we mentioned earlier), and such an important one too! Not only for their cognitive and physical development – think of the pride and joy they can experience reaching such great heights all by themselves. walk. Instead of buying dangerous walkers that gain speed they can‘t control kids find themselves furnishings, boxes or big objects they can push around. Once they are able to walk it becomes more interesting to pull things. It keeps them busy and they have the feeling of actually working. In the first stage of their interest in collecting, children begin to gather together toys that are identical, to later start putting them together in line, or alongside one another. At this point it is important to have more than one of something within reach or in sight. This later develops into categorizing objects, putting them into containers or in piles, depending on their shape, colour, size etc. (we talked about this also with our boys and their favourite cars. Only later on the child begins to also be interested in the result – at first you will probably see collecting to fill a box, but later he might also keep the box close by as a sign of what he has accomplished. Knowing what these urges are, and that it would be near impossible (and also possibly harmful) to control them, helps us parents to allow our children to safely explore what they need to explore. The action in itself is most of the time not as important as the child’s need to fulfill the urge – knowing what these urges are allows us to see them as learning experience, rather than perhaps some unwanted behavior (such as climbing dangerous places, pouring water out of the cup etc.). So before you head to the toy store – think of what is actually in your house. Or don‘t even think and let your child explore. That a laundry basket is great for climbing in and out, for putting things inside or pushing it around the room. That a shopping bag is not just for emptying but also for putting all the things back inside (you might not see much of your shopping for an hour after you got home). 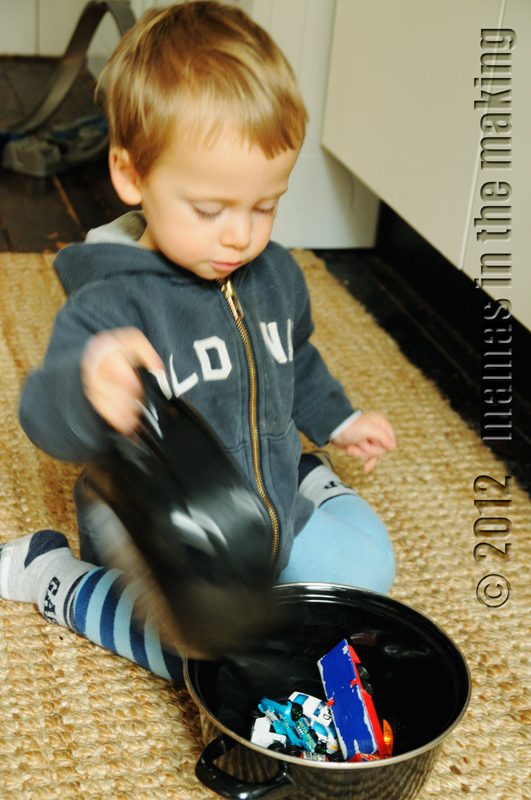 And that pots, bowls and Tupperware make great hats – more on that in our next post! And before you leave the house with a toddler – make sure you have got a spare set of socks and shoes (or waterproof boots). Because these puddles ARE very very tempting! Recently in a parent‘s consultation we were told that Leander was reluctant to take the Montessori materials off the shelves and they asked what he was interested in playing with at home. 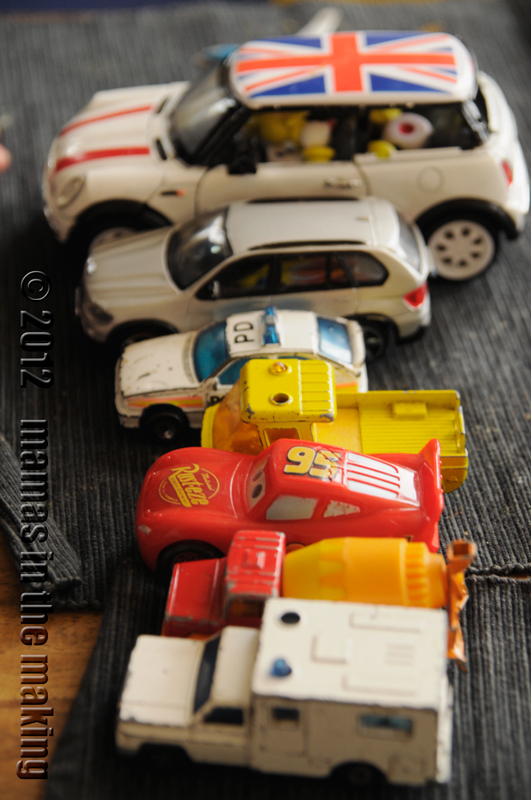 We said: “Toy cars.“ But those are not allowed in The Children‘s House. They are not part of the Montessori Concept. 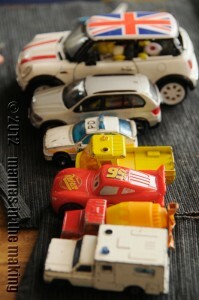 In fact: They had toy cars and cards accordingly so the kids could match the cars with the cards. But all the boys did was play with the cars, not the material as it was meant to be. So they took the cars away. They also took the little London bus that served as a moneybox for which they had provided little buttons in a basket to put inside the moneybox. 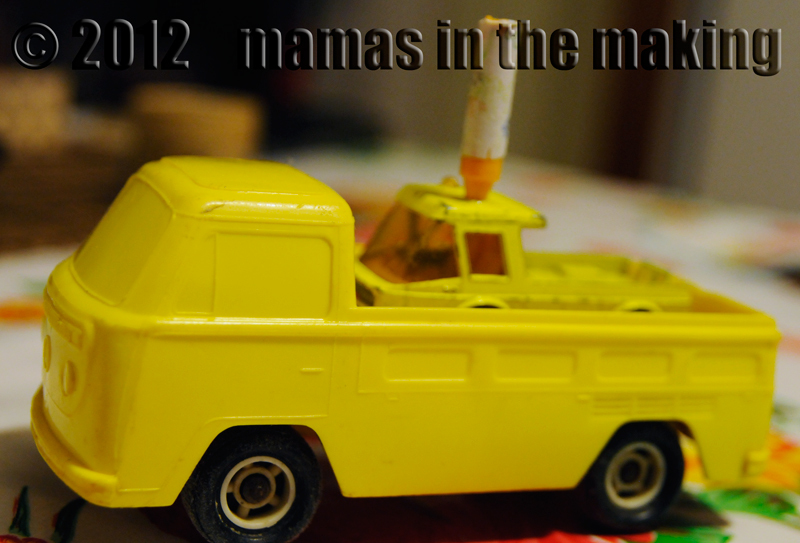 But as you may guess – the boys only played with the bus as a bus, not a moneybox. What is our fear when we try and move the focus of our child‘s play to something else? That he could miss out on something important? And if so – what? There is so much to learn when you are a child that we as parents often feel the need to fill our kid‘s brain with information. Constantly. And who can blame us? As soon as we become parents we ourselves are filled with information and offered all sorts of classes and groups to attend that encourage and foster all sorts of life-important areas such as music, creativity, language, science. You name it. 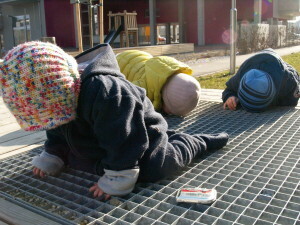 Parent-infant classes as Emmi Pikler or Magda Gerber ( http://www.rie.org/classes/parent-infant ) offered are questioned because the children are not given any input, no songs are sung and no activities lead. What is the point if the child is not learning anything? What we might miss out on from the very beginning is trust. Trust in our own children, that they have it all and are able and most importantly willing to learn. Maria Montessori said: “A child cannot NOT learn.“ Whatever a child does – he is learning. It‘s just not always obvious to us adults who seem to know everything but in fact quite often – seem to know nothing. This trust is taken from us during those first days, weeks and months when we start focusing on children‘s play and age appropriate toys. Every packaging of a toy has a big bubble blown up that states what this toy is encouraging. May it be “just“ creativity or even logical and scientific thinking. And it is hard not to look at it and choose just simple play objects. In the end – everyone has it. And is amazed. So there must be something to it, right? Right? Another reason why parents are so worried their children might miss out if not being offered early learning opportunities in all sorts of ways, is our own background. If we feel we haven‘t achieved everything we quickly project those expectations on our own children. So they at least do better in writing, spelling, math, playing an instrument or whatever. And how can this be achieved other than by attending a class that offers it all? We might not harm them directly by offering them charts with letters to be able to read at an early age. But we harm them by not leaving them enough time and room to explore on their own. To engage with something they are interested in. And maybe even learn to read, write and count in the process – who knows? But how much more fun would it be, if this whole learning was done on their terms, while playing with their beloved cars, sea animals or tea sets? We have already talked a lot about how important movement is in development of play, and how much of movement is really play. When just playing with cars? Well, there is the pushing and pulling that can get discovered, practised, and practised again – what surfaces and slopes are better for which one? What happens when you pull the truck downhill? And then there are the fine, small movements, which we probably barely even think about now that we just have them all in our toolbox – opening and closing tiny doors, and putting little people (or, in A’s case – allspice) inside, taking them out, making sure they are sitting upright and that they all fit – these are all extremely precise movements of hand and fingers. Have a look at how your child is trying to manipulate something small – it really is fascinating! The only thing we have been very careful of is not to have an agenda. If they ask what color the car is, we try and answer ‘yellow’ – not have them guess, or try and make them remember. We believe the trust the boys put in us by asking us to tell them names of things in the world needs to be respected for what it is, rather than unnecessarily tested. Hypothesis: Some cars, when pushed, go faster than others. Tested for the van versus the truck. Will it also be true for other cars? Which ones? Hypothesis: Some cars are much bigger/ heavier/ longer than others. Tested. True, with different answers for different combinations. Hypothesis: Some cars will fit into other cars. Tested for some, true for some. Hypothesis: Some cars break when thrown on the floor. Tested for one. Enough proof obtained. Not willing to test on others. And of course there are the many categories that they have been using to organize the cars – by size, speed, length, color… These discoveries are particularly engrossing; it takes hours to figure out just the right way, and is as fascinating to watch as any Discovery channel documentary. These categories, discovered on cars, sea animals, tea sets, so early on, help all of us understand life later on without going crazy. A. became scared of flying, especially take off and landing, once he turned 2 and had to be in his own seat. On our return from a first trip like that, he dug out a plane tucked neatly among his many cars. He was practising taking off and landing for a couple of days. 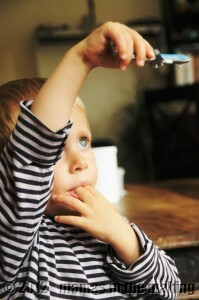 He put his plane in the air (on the windowsill), then took one of his cars (that’s right, cars!) in his hand and proceeded to explain to the car: “You are bigger now, you will have your own seat on the plane. You can hold my hand.” I watched quietly as this play continued for another few days. We were due to take another flight in a week or so. It was much better. … sometimes they are potatoes, when you need to go shopping and fill your bag with them; sometimes they are chopped veggies that will taste so nice for dinner tonight; sometimes they are people, or animals. They really are what you want them to be. Just like acorns can be coffee, once you put them in a cup, or a turtle can be a table when you put a cup on top of it. Which is why it’s ok that our boys don’t have all the toys in the world – they really only need the ones they have. If they did have all those toys, would it be half the fun? Oh and just maybe – social stuff? Kind of funny, but it is also quite amazing. A. has two tractors, but only one little cart that goes on the back of the wooden tractors. I have just found out recently that the two tractors share the cart. A. usually explains to one of the tractors that the other will now borrow the cart, but that later it will be back. Not quite what is happening on the playground yet. So does it matter that they have been playing mostly with cars for… well, quite a while now? We’re not too worried about that, to be honest. 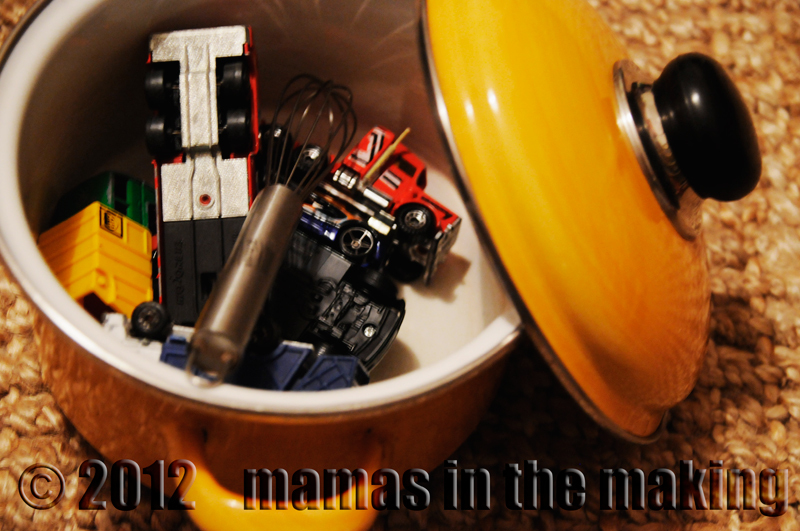 It doesn’t matter if our boys are playing with cars, sea animals, or tea sets. What matters is how they think and feel as they play. 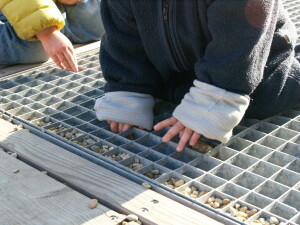 And to let them develop in this thinking and feeling as they play, to let them discover the creative possibilities and scientific facts, we are choosing to give them the freedom to choose what they want to play with, how they want to do it, and the time and space for their explorations. 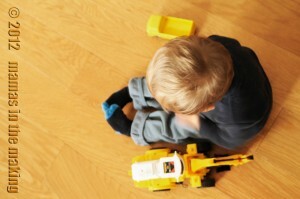 What about your children – do they have their favorite toys, or play objects? What are they? We would love to hear your thoughts!